Home How to Indian Shoppers Money Online Shopping Tips How to save money while online shopping? Online shopping is growing by the day. We’ve seen this recently ever more so in India, especially thanks to online shopping festivals like the GOSF. However, with a rise in any sort of industry comes a rise in prices too sometimes, so although online shopping can do a lot to help you save on time and give you an infinite choice of shops to choose from, it can still be pretty heavy on your pocket. Here are some tips I encourage online shopping users to follow adamantly… especially if you are having trouble saving! Have you ever heard of a one-stop website? One-stop websites are online portals that are doing you a great favour by grouping together multiple stores that sell similar items under the same roof. Instead of having to individually visit each store online, you can simply view what those shops have to offer all on the same page, usually with the option to compare prices (either directly or indirectly). Well, actually, the term “one-term” gets thrown around a lot particularly for advertising purposes, but some websites like to remain true to their calling and ARE in fact one-stop websites. For instance: Shopatplaces is focused on ethnic India apparel, jewellery, bags, shoes and fragrances. You can shop at a number of popular places for any of these things. Foodpanda and Justeat are both great websites for finding fast food from a variety of restaurants at great prices. Don’t let the fancy title throw you off. I’m really just talking about websites like Ebay, Amazon and Flipkart that have price and category filters installed just for you to be able to narrow down your search. Tradus and Shopclues has also been praised for having the lowest prices you can find, though these sites do not provide you with a price filter. For the purposes of this article, pay special attention to how you can filter your search by price and budget. That’s precisely why these websites are so popular too! Every time I come by someone who has not heard of coupon codes or vouchers, a part of me dies, just a little bit. One of the biggest advantages to shopping online is that you can always find special deals for shops that otherwise are not available in their physical outlets. Many coupon websites exist to bring you closer to great discounts such as Flipit.com/in. Other more obvious sites are Coupondunia, Couponnation and Couponindia. 5. Don’t forget about shipping costs! Most of the time, people think they’ve come across a bargain when they find the product that they were searching for at low cost. I’m not saying that it’s impossible to walk away with a great deal, but always pay attention to shipping costs before you click that “buy now” button. If you live in a particularly remote location in India, shipping costs can easily amount to half as much as the cost of the product you’re buying. Not such a great deal in the end, huh? Always check if the shop your own has free delivery (a lot of them do! ), and for those that don’t, double check how much shipping will cost you, do the math and make an informed purchase. Tip: Don’t fall for shops that try to offer you free delivery on condition that you meet a minimum value order unless that minimum meets your budget! 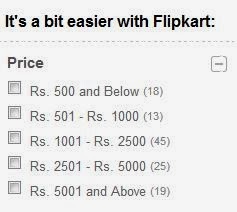 It may sound like I am repeating myself, but do not confuse price and category filters such as those offered by Flipkart with websites that give you the capability to actually compare the prices of items across categories. Some websites like Compareindia focus particularly on smart phones, computers and PC accessories that are often amongst the highest-costing products you will ever buy online, and that’s why this website is particularly useful for comparing between different brands and prices so that you can get a better picture of which laptops or mobiles are the most cost effective. 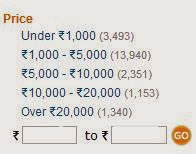 Other websites offering price comparison services are Junglee from the creators of Amazon, Pricedekho and Shopmania. Now you’re going to think that I’m as annoying as those pop-ups that appear on the middle of your screen every time you visit a website that is requesting you to join their newsletter. Actually, I’m only trying to help you play around that card. Did you know that a lot of websites encourage customers to join their newsletter by offering a gift voucher or worthy discount to claim simply by entering their email address or making a first purchase? If you know that you’re only going to buy from that site once, and the offer is pretty tempting, then just go for it. If you know you’re going to become a repeat customer, then it’s probably worth becoming a member anyway since most websites give exclusive deals away to their members! Worst case scenario? If after you’ve used up the one-time-only gift voucher by signing up and you don’t ever want to receive a single email from that merchant again (for whatever reason), you can always just look for the option to unsubscribe or filter out their newsletter to your spam box if you can’t do that and you’ll never have to peak at that newsletter again. Self-explanatory. Look for cashback sites like Topcashback that will allow you to buy products that you can redeem a certain percentage of the cost back with. Other popular sites include Apnacashback and Penniful. It’s good to be aware of the cheapest buys out there, but be wary of low quality products especially in the mobile and electronics industry. You wouldn't want to purchase a mobile phone from an unheard of brand name just because the price was too good to be true. Think of it: there must be a reason why it’s been priced so cheaply. Ironically, there is always a price to pay for cheap products. Think along the lines of maintenance costs and worse yet: the cost of replacement. A lot of people fall into this trap. They think that they are saving more money this way, but in fact, they are only saving in the short-term and costing themselves more in the long term. If you go for the cheapest product out there, it will probably go bad on you sooner than its not-as-cheap equivalent. Unless you really trust the retailer that you are making your purchase from, stay away from extra cheap items. You can treat yourself every now and then – there is really nothing wrong with that, unless you intend on blowing your last Rs. 100 on some lottery ticket (I wouldn't recommend that!). Online shopping can be really tempting simply because there is just far too much choice out there, but don’t let this manipulate you. Always think twice before you buy something. In other words, do not be an impulsive buyer. Think about your budget and the need behind the item you have your eye on. If it isn't something you need, and not something you REALLY want, veer away and save.